Santorini is the Cyclades’ southernmost island, situated on the Southern Aegean volcano belt which runs from the Methana peninsula on the Peloponnesus through the islands of Milos and Santorini up to Nisyros, next to the Turkish coast. The name of Santorini actually refers to a small archipelago, formed by the main island Thira and the islands Thirassia, Palea Kameni, Nea Kameni and Aspronisi. 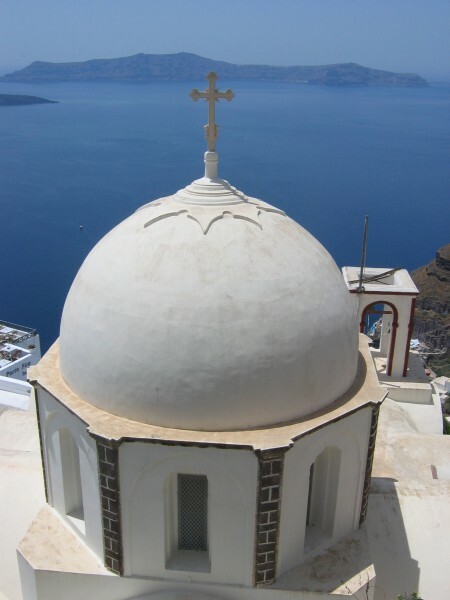 Thira is often equated with Santorini, the other small islands being rather unknown. Here, too, we will use the names of Thira and Santorini as equipollent. Whilst Thira and Thirassia are inhabitated, the Kameni islands and Aspronisi never have been populated because of their small size and their geology. Thira has about 10,000 inhabitants, or at least that is the number of officially registrated inhabitants – during the peak seasons a lot of tourists accrue. The small Thirassia island is not too far away but you will find a totally different world here. The about 150 inhabitants truly appreciate their contemplative life. The distance to tourism is actually much bigger than the few kilometres between both islands would suggest. Thira has an area of about 72 km2. Its most striking trait is its unique geology, which fascinates visitors from all over the planet. The archipelago is actually a volcano’s hangover; the volcano erupted 1,600 years b.C. A part of the caldera remained as a result of this natural disaster; this part is mainly today’s Thira. The island has more or less the form of a crescent, opened to the west. Its exterior coast declines only flatly, but the inner one plunges down almost vertically into the caldera. From this about 300 m high cliff you can enjoy one of the most spectacular impressions of the whole Greek island world. Up here there are the villages of Fira, Firostefani, Imerovigli and Oia, their houses and lanes almost seeming to slip away over the caldera’s edge. Santorini’s hightest mountain is the Profitis Ilias, which is about 568 m high. Here there is also the equally named cloister, from where you can enjoy a brilliant view over the whole archipelago. Profitis Ilias’ mountain range clearly interrupts the flat Eastern coast of Thira, plunging down towards the Caldera.